What’s instructive – especially in contrast with the personalization of Palestinians per the photo of the young boy – is that Israeli fears are never equally personalized, their concerns conveyed, at best, as mere abstractions. Indeed, it wouldn’t have been difficult for Sherwood to note that the smuggling of weapons into Gaza (via state actors like Iran) is a very real and deadly reality. Since the Egyptian “revolution”, and Mubarak’s departure, hundreds of rockets, capable of hitting targets within a 12-25 mile range, have been smuggled into the Gaza Strip, as have some 1,000 mortar shells, dozens of anti-tank missiles and tons of both explosives and explosive-manufacturing materials – according to the Shin Bet. 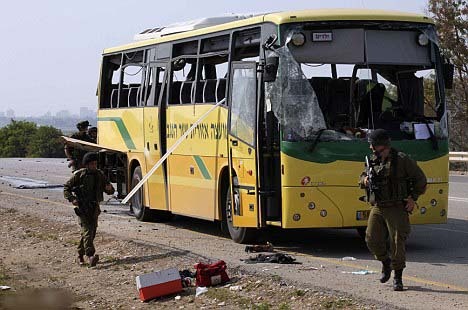 And, here’s the effect of such a missile on the yellow Israeli school bus targeted by Hamas in April. And, here’s a picture of the Israeli teen killed in the attack – Daniel Aryeh ben Tamar. Daniel died on April 17th, and it is instructive that neither Sherwood, nor any of her Guardian colleagues, have deemed it worthy to note his passing. During the writing of her article Ms. Sherwood was in her usual full omission mode. She conveniently left out the pretty relevant fact that the opening of the Rfah crossing without international supervision is a breach of an agreement between Egypt and Israel – signed by the EU too. In 2005, when Israel decided to pull out of the Gaza Strip, Israel and Egypt reached an agreement regarding the border, based on the principles of the 1979 peace treaty. The agreement specified that 750 Egyptian border guards would be deployed along the length of the border, and both Egypt and Israel pledged to work together to stem terrorism, arms smuggling, and other illegal cross-border activities. In September 2005, following Israel’s withdrawal from the Gaza Strip, control of the Philadelphi corridor was handed over to the Palestinian National Authority. Under an agreement reached in November 2005, the European Union Border Assistance Mission Rafah was responsible for monitoring the Rafah Border Crossing. 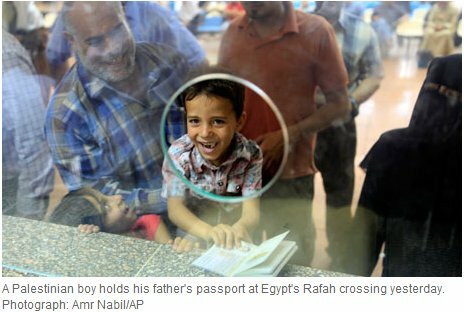 From November 2005 until July 2007, the Rafah Crossing was jointly controlled by Egypt and the Palestinian Authority, with the European Union monitoring Palestinian compliance on the Gaza side. In other words the new Egypt suffering from the obamasque Arab Spring fever did its first step of unilaterally abrogating the Camp David Accord signed by Egypt and Israel in 1979. That can’t be said often enough. The BBC here is celebrating Gazans’ freedom and not a word said about legality. It will no doubt be worse on the World Service. It even used the same photograph as your report. You say ” it is instructive that neither Sherwood, nor any of her Guardian colleagues, have deemed it worthy to note his passing” and I have seen the same point made elsewhere on CiF Watch. This was no doubt a tragic occurrence but just try to take detached view of it for a moment. Scores of Palestinians, including many children, were injured in the recent Nakba Day protests; some of them no doubt died later. I saw no reports anywhere of these deaths from injuries, nor did I expect to. Why is the death from injuries of an Israeli child any different? Thanks for your post sencar. You (together with your fellow travellers like sanity, harmless, etc.) are the best proof of the total moral and intellectual failure of the “anti-Zionist” crowd. All of the casualties of the Nakba day tried to enter illegally and violently into sovereign Israeli territory. No any other country would tolerate similar attempts. Interesting to know who are the parents who send or allow their children to particiapate in predictably violent and agressive acts. The Israeli child didn’t try to enter into Gaza, he simply was on a schoolbus. Good to see your true face, please show it again and again. I could debate with you the morality of both sides’ behaviour during the Nakba Day protests but will not do so since that wasn’t the purpose of my post. The Nakba Day deaths were just a recent example. I dare say that we could agree SOME Palestinians who have died from injuries in entirely innocent circumstances. My point was that it is not normal journalistic practice to report most of these deaths, whatever their nationality. Berating The Guardian for having the same news values as the rest of the world press is not helpful. Do you mean the same news values as Reuters? I would say you couldn’t make it up… but you did. First, the media widely reported the numbers of casualties from the coordinated efforts by Lebanese, Syrians, and Palestinians to storm Israeli borders. They may not have published names, but they certainly noted the number of those killed. Again, the Guardian never noted that an Israeli civilian teen intentionally targeted by Hamas had died from his injuries (They covered the initial attack but it doesn’t seem too much to ask that their Jerusalem correspondent follow up with the story and report the teen’s passing). More importantly, the moral equivalence you’re suggesting is indefensible. Daniel was a teen on a yellow school bus. He didn’t represent a threat to Hamas and was still targeted (and even bragged about their military “operation” on their website). It seems reasonable to expect the Guardian and MSM to report this fact. 2) “Conclusive proof that the BBC avoided publicising the Holocaust until the war was virtually over comes from Paul Winterton, a wartime News Chronicle Moscow correspondent and BBC contributor. Eight months before Dimbleby walked into Belsen, he accompanied the Red Army into Majdanek, the first Nazi death camp to be liberated. His account survives in the BBC sound archive. Winterton speaks of “the most horrible story I will ever have to tell you” and describes in brutal detail this appalling extermination camp. We really shouldn’t be surprised that the Guardian should be behaving in this manner. The anti-Semitism that drove Europe to collaborate in the Holocaust today drives newspapers like the Guardian in its campaign against the Jewish state. Anti-Semitism is so deeply rooted in the culture of the European gentiles that it will never be eradicated, and the Guardian is simply an indicator of the filth and the evil that lies at the heart of European society. He could be driving down any street in rural America. When will it finally penetrate the thick skulls at the Guardian that just like anywhere else in the world there are rich as well as poor in Gaza? If you scan through he photographs so helpfully provided by the Guardian, you cannot but admire both the quantity and quality of the suitcases and bags that the Gazans use to transport their goods. She’s back and has thrown those imaginary Bedouin villages in the Negev into her cauldron. And David Cameron. Shame on Cameron. I haven’t worked my way through the whole thing yet.